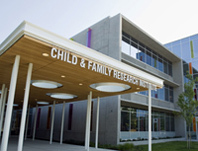 CUPIC is housed in the Translational Research Building at the Child & Family Research Institute (CFRI) on the campus of the BC Children's Hospital in Vancouver, BC. CUPIC comprises 11,200 square feet of research space on the second, fourth and fifth floors of the Translational Research Building which was completed in 2010. The infrastructure consists of of a cluster of wet labs and core facilities situated in functional proximity to one another. The Tissue Culture, Immunology, Genetics and Multi-User Equipment Cores contain state-of-the-art facilities for modern genomic, cell and molecular biology, including multi-colour flow cytometry. The Tissue Culture Core includes a Level 3 biocontainment lab, initially dedicated to the study of tuberculosis, but having the flexibility required for the study of other emerging level 3 pathogens. The Tissue & Microbe Bank provides researchers in BC, Canada and the world with its unique collection of human pathogens. The Clinical Infections/Vaccinology and Clinical Studies Cores are the 'face' of CUPIC and will provide the setting for research with children, as well as for epidemiology, clinical trials and community-based research.